Firefox 14.0+, Safari 5.0+, Internet Explorer 9+, Chrome 24+ . Windows 7+, OSX 10.6+ . A standard DSL line with a minimum upload and download speed of 250kbps . For making Audio or Video calls, one of the chat members must be an Operator . 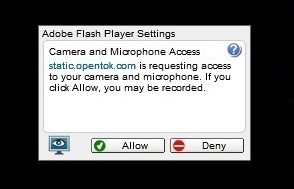 Click the "Allow" button in the adobe flash player setting panel to access the microphone and the webcam devices. Please follow the below given steps if you face problems on clicking the Allow button in the Adobe player. Right click the player and select 'Global settings'. Click on 'Camera and Microphone Settings by site' button from the tab 'Camera and Mic' . Add 'static.opentok.com' and select 'Allow' option in the dropdown . Terminate the existing chat session and restart your browser in order to begin new chat. Goto Adobe flash player settings and select 'static.opentok.com' and choose "Always allow". Terminate and restart browser and start chat . '/[audio or video] req nick' : (ex: '/audio req Jack' ) command sends the chat invite to the specified Nick.Chat invite will expire after a duration of 10 minutes . Clicking on button or command '/[audio or video] acc nick' : (ex: '/video acc Sky' ) accepts the chat invite from specified Nick and opens new popup window to chat . It will not interrupt the on-going room chats . Clicking on button or command '/[audio or video] rej nick' : (ex: '/video rej Sky' ) rejects the chat invite from specified Nick and will inform the Nick that you have rejected it . Nick should be active in either room chat or audio video chat. Otherwise the chat session will be terminated for being idle and the Nick will be auto kicked stating the reason . Popup chat window contains private instant messaging facility. This will enable the nicks to remain active in both audio/video chat and in the room chat as well . If Nick wants to end the chat session,use command '/[audio or video] terminate' in the main room . '/[audio or video] terminate' : (ex: '/audio terminate' ) command ends the current audio/video chat and it will automatically close the chat window . '/[audio or video] terminate all' : (ex: '/audio terminate all' ) command ends the current audio or video chat and all the chat invites sent will be expired .